Well known in women’s business and club circles, Miss Anne Jane MENARY died Thursday at her home, 96 Alexander Street following a protracted illness. She was a past president of the Canadian Business and Professional Women’s Club and secretary of the Veterans’ 1866 Chapter I.O.D.E.. She was also a member of the Women’s Canadian and Conservative Club, Lake Shore Golf and Country Club and St. Andrew’s United Church. Daughter of the later William and Sarah Cotton Menary, Miss Menary was born in Orangeville. She received her education in the public and high schools of that town. She had been a resident of Toronto for some years. Surviving are four brothers, John A. and Fred C. of Toronto; William R. of Windsor and Ernest A. of Orangeville, and one sister E.C. Menary, of Toronto. A letter, dated 1939 March 29 Letter from Edna (Mrs. Frank Sherk, 1224 Avenue Road, Toronto) to Mary (née MENARY) WRIGHT at Gilford Castle - also in the family archives of Gilford Castle gives the news that Aunt Anne passed away (this would be Anne Jane MENARY d. Mar 16, 1939) of breast cancer. Her sister Aunt Elizabeth (this would be Elizabeth C. MENARY of Toronto) was holding up very well. 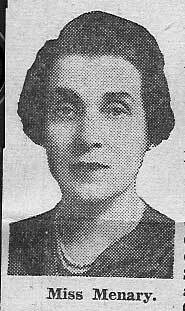 Edna (author of the letter) also talks of travelling to Ireland and visiting Mary (nee Menary) WRIGHT of Gilford Castle.